He taught us how to channel out love of dancing Groot into adorable cupcakes, now JK Denim is giving us a welcomed tutorial on how to satisfy our cravings for The Hunger Games: Mockingjay - Part 1 with a delectable fan art pie! This vid spares us the nitty gritty on making the requisite doughs, but JK's got recipes for both shortbread and apple pie, in case you need some help there. Once you've placed your dough and crimped it, you fill it up with the fruit of your choice. Roll out your shortbread dough, cut it to the stencil he's provided. JK breaks down the careful application of the how these bits of cut dough will all fit together. Bake as directed above, and for an added dash of Capitol style glitz, spray your creation with some edible gold spray ("spray paint for your food!") And voila! JK is adorable. 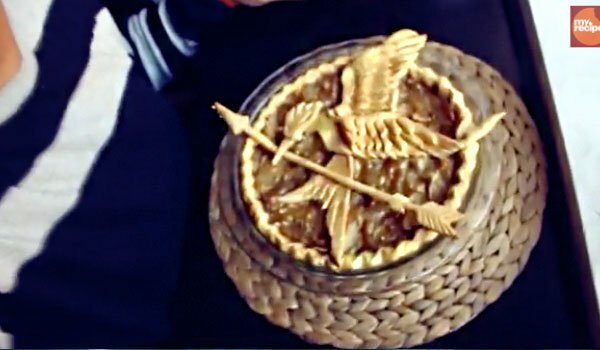 At the end of his video, he stares at his Hunger Games pie and admits, "Sometimes I look at the things that I make, and I'm just in awe." Us too, buddy. With Thanksgiving approaching along with the release The Hunger Games: Mockingjay - Part 1, this beautiful pie would be the perfect thing to roll out with for the big family meal. But with Halloween just around the corner, might we also suggest some other fan art recipes? How about a giant cookie that pays homage to the new horror movie Ouija? Or maybe you'd like to toast the Day of the Dead with Book of Life-themed cake! There's plenty more awesome movie-based recipes, so check 'em out and start cooking!